At the mid-point of second-quarter earnings season, America’s iconic blue-chip companies are tearing off the tank tops and putting their full top- and bottom-line performances on display for all the investing world to gawk at. One institutional darling after another is reporting the kind of numbers that stoke the animal spirits like no other catalyst can. This is the seminal moment for the bulls. Cries of an overbought market are coming from every corner of the investment world. Yet, not a lot of people are selling unless some algorithmic computer program triggers a sell signal that is quickly pounced on as yet another rare opportunity to average up in what is looking to be a fantastic year for stocks. When Boeing (BA) rallies 30 points, McDonald’s (MCD) goes up 13 points and Caterpillar (CAT) climbs eight points, it’s quite an impressive feat, especially because these are not FANG stocks (Facebook, Amazon, Netflix, Google). Far from it. But what they do represent is how a soft dollar can complement organic growth in a meaningful way. 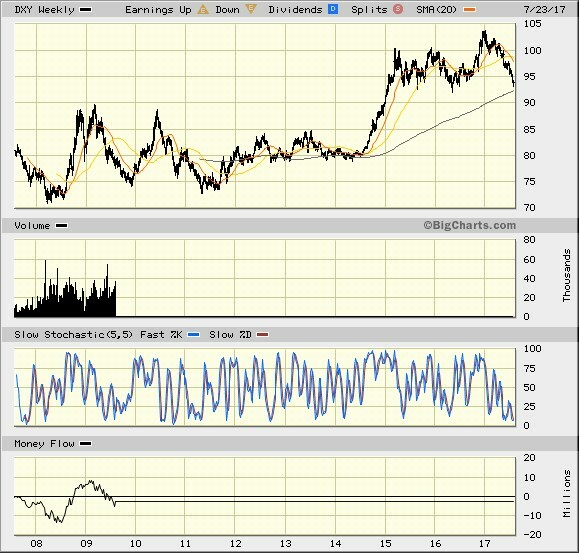 The Dollar Index (DXY) has declined 10.14% since peaking in early January at 103.82. It now trades at 92.30, which is a boon to the foreign exchange component of corporate profits. Second-quarter earnings are expected to increase 10.8% from Q2 2016. 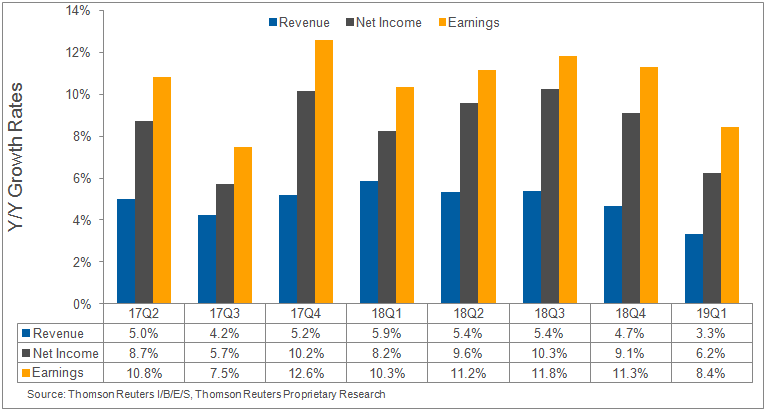 Excluding the energy sector, earnings growth is estimated to decline to 8.2%. expectations. This is above the long-term average of 64% and above the prior four quarters’ average of 71%. The Q2 2017 blended revenue growth estimate is 5.0%. Excluding the energy sector, the revenue growth estimate declines to 4.1%. 70.9% of companies have reported Q2 2017 revenue above analysts’ expectations. This is above the long-term average of 59% and above the prior four quarters’ average of 56%. The powerful rally in the euro is the reason there is a huge currency counter-intuitive trade occurring. 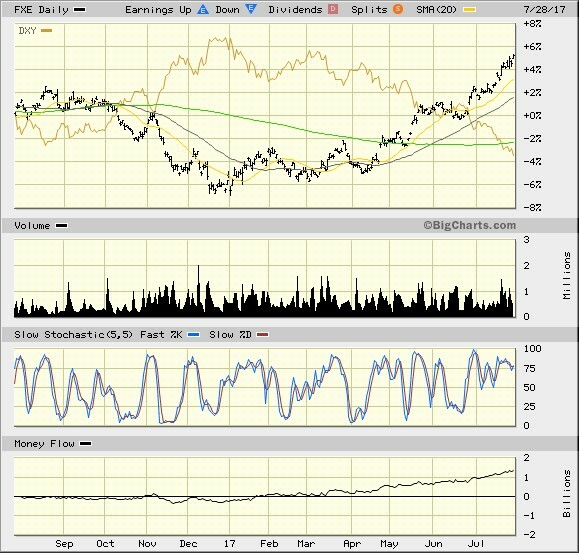 From the chart below, when the Dollar Index (DXY) is laid over the Currency Shares Euro Trust ETF (FXE), one can easily see the inverse relationship the dollar and the euro are experiencing. Whether this spread widens further is anyone’s guess, but it has Captain (corporate) America in full profit mode, waiting with bated breath for a tax reform bill and an infrastructure spending bill to make their way through the House of Representatives. The mighty sell-off in the dollar is not getting nearly as much play from the talking heads as the dollar did when it was rallying to new multi-year highs. I’ll go back to the charts, because by now, most of us who have been at this business for several years know that the charts don’t lie. There is a rising trend line that denotes something in the realm of a 200-300 week moving average, depending on the technical indicators being plugged in. That line comes in to play just under where the DXY currently trades. Call it the Dollar’s Red Line in the Sand that, if broken to the downside, could spark a further sell-off to the 85 mark. My personal view is that the 92 point support line will indeed hold, as central banks will intervene to prevent a further rise in the euro that would curtail exports and hurt profits in what is still a nascent recovery for that regional economy. However, that doesn’t mean the dollar can’t camp out under the 95 point line for many weeks, if not months. In any case, professional fund managers have taken notice of the stimulus effect the weak dollar is having on Q2 profits, along with its spillover effect that will show up in Q3 earnings. And this all comes with momentum building for tax reform and big project spending to come to the floor for debate and possibly passage. If not, then the same dynamics continue to work for the bulls — a 2.5-3.0% rate of gross domestic product (GDP) growth and a Fed that maintains a dovish stance. When earnings for the S&P are rising as fast or faster than the index is advancing, this rally could go well into extra innings.